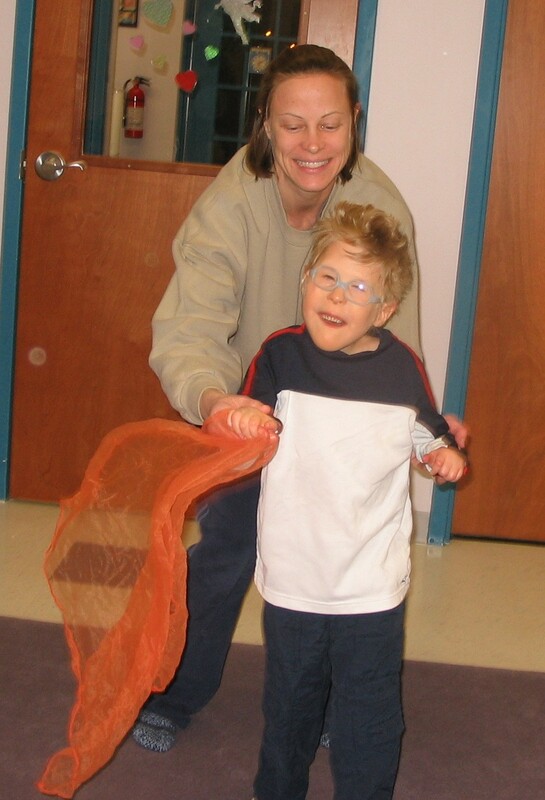 Special Needs in Kindermusik provides pure JOY! “Wow, look at what Greyson is accomplishing in class now!” I am so amazed at how music influences the progress of special needs students in my Kindermusik classes. Greyson is one such child. He has Distal Trisomy 10, a rare genetic disorder. 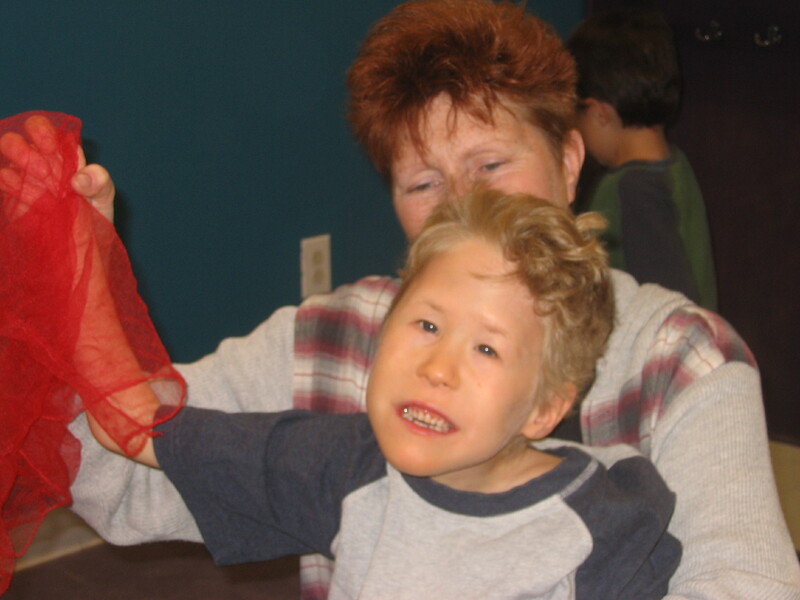 Greyson deals with challenges in physical, verbal and visual development. Over the course of the last two years attending Kindermusik classes at our studio I have seen him progress from a child who mostly mouthed instruments, with very little motor ability and almost no communication in class, to a child who not only is moving a lot (with assistance) and playing instruments. Greyson now reaches for the instruments he wants, sings in his own special way, and last night put his instruments away into our box when we finished letting go easily and smiled throughout the majority of class! Last night he wore his brand new glasses in class for the first time. It is an adjustment to have something on your face when you are not used to it. Mom was consistent in her approach and allowed him a break every now and then. By the middle of the class Greyson was looking all around with a much different expression on his face. Recently, before glasses, I observed that Greyson’s desire to keep pace with class activities was increasing. He loves walking around the room at a pretty quick pace holding mom or ‘Grandy’s’ hand and it is a joy to see his progress. The class is very supportive of Greyson’s involvement in class and as you can see he is having a great time! Greyson with Mom in February with his new glasses on! Greyson is in Family Time class with brother Ryan enjoying ‘Make Way for Music’! Music’s effect on all children are evident in studies showing the significance of it’s impact on positive developmental skills in cognitive, emotional, social, physical, and language abilities. In special needs children it’s impact can be even greater! The idea of “whole brain” means utilizing both left and right brain at the same time. For example, left brain activity is responsible for logical thinking, facts, sequential and analytical thinking, while right brain activity is responsible for utilizing the imagination, creativity, feelings, and intuition. Music classes are one way of utilizing the “whole-brain”. As a result musical activity makes your child learn better. The key words here are “musical” and “activity”; not just listening to music but being involved in music making and musical moving. So what can your family do to provide a “whole-brain”, “whole body”, “whole child” experience? Be involved in musical learning and moving. For your youngest member of the family sing, dance, feel the beat, play instruments to the beat and expose them to a variety of quality musical experiences. 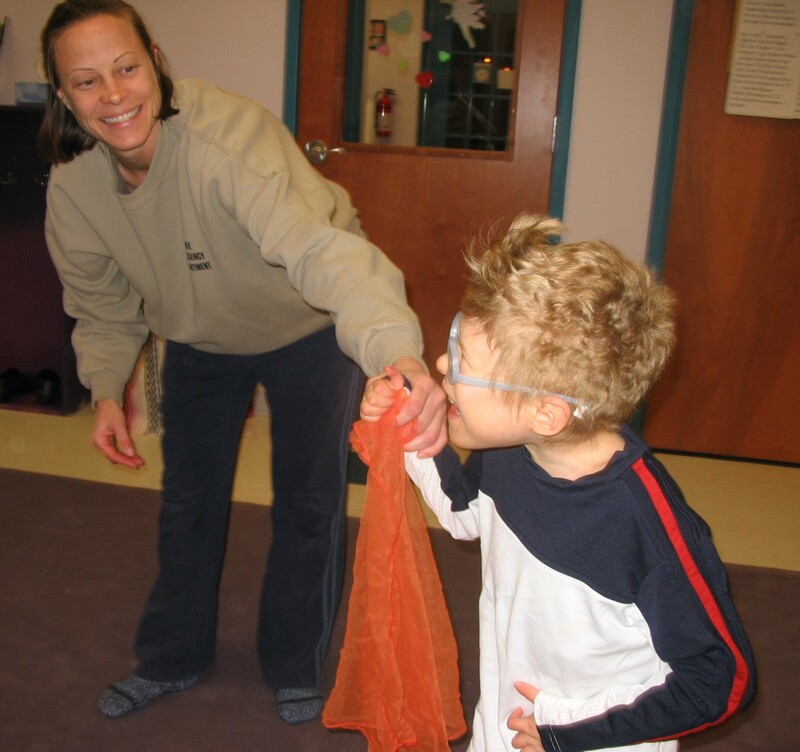 As your child becomes more able to communicate participating in music and movement is still a key to learning. 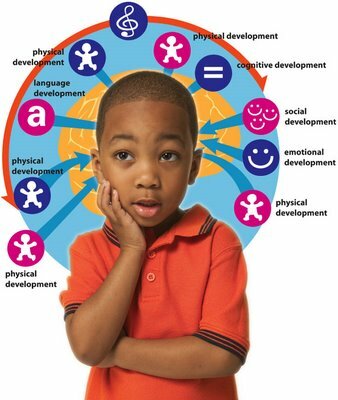 Now add memorizing of songs, learning about note values, and rhythm values, and facts about the kinds of music you move and sing to and you make it a “whole-brain”, “whole body”, and “whole child” experience. Plus it is just plain FUN! There are many articles online about this topic and I recommend if you are interested, that you Google right and left brain, and music and the brain and you will see literally millions of responses. However, there is something right here in Clayton that will assist you as a family to achieve “whole-brain”, “whole body”, “whole child” success! What is it? Kindermusik! No longer downtown but in the Riverwood Cultural Arts Center on Cunningham Lane, is Kindermusik of Clayton & Voice of Clayton. There are classes for infants through early elementary age children and they involve the family. Now is the time to look into what is being offered as Spring semester is starting. For the older elementary child and on through adult age there are private lessons. If your schedule is tight and you think you are too busy, you might want to check out the Monthly Specials…one day events and 4 or 5 day classes that allow you to try out Kindermusik without the semester commitment. Don’t forget Summer is right around the corner and there are short class offerings for you to break up the monotony of your summer already waiting online for you to sign up! Kindermusik of Clayton & Voice of Clayton offers a full range of Kindermusik Core programs, including Village for 0-18 months, Sign and Sing for 6 months-2 ½ years, Our Time for 1 ½ to 3 ½ years, Imagine That for 3 ½ to 5 years, and Young Child for 5-7 year olds. Additional classes for Families and Preschoolers are also available, as well as Monthly Specials to aid you in making a wise choice for your family, and private voice lessons for your older child and teen or even for you. To learn more about Winter/Spring Semester, Monthly Specials and Summer Schedule opportunities please call Julie Stewart at 359-3473, or 359-0022; you may also email your interest to kmclayton@mindspring.com or check things out online where you can register now! www.kindermusikofclayton.com Kindermusik of Clayton & Voice of Clayton is a part of the Riverwood Cultural Arts Center in the Riverwood Athletic Club Development. Every day I teach Kindermusik is a day I see growth and success in the faces of young children and their parents. This evening in our second Away We Go class the entire group of children and their parents were so engaged and having fun. Our ‘train’ zoomed and crawled and stopped and started and whistled and dinged it’s way around and around. Even the shy ones became so involved. I must get the camera out again to capture some of this fun! During music and movement storytime you would have thought Shiney Dinah was right there in the midst of our class. The children were mesmerized during the story and already many of them are choo, chooing and tapping the beat to our train rhythm on every page. We hid and found egg shakers, car keys (specially made for class) and jingle bells over and over. I hid the keys on top of my head and wouldn’t you know that was a favorite place for all the keys to be found! Dancing was also fun! This is going to be a great semester!